Having a roommate can be a pain if she eats your food or lets her cat poop in your shoes. But for older single women, living with someone can actually be a blessing. And lots of ladies are going this route. An increasing number of single midlifers and retirees are moving in together to improve their standard of living and find companionship. Of those, the vast majority are women. In 2010 there were approximately 480,000 boomer women living with at least one female nonrelative roommate — without a husband in sight, according to an AARP analysis of population survey data. 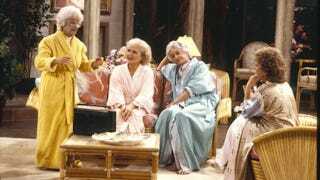 That's approximately 130,000 Golden-Girl-type households across the country. Cynthia Hansen, who runs a home-sharing program for seniors, tells Ganahl that women often outlive men, and are less likely to remarry after divorce or widowhood, so they're more likely to seek roommate arrangements. And while roommate mismatches can lead to friction, a good roommate can make life better: "If they choose carefully, and for the right reasons, there is no downside." The concept makes a lot of sense. The wrong roommate can be a serious annoyance (see above re: food-eating, shoe-pooping), but the right one can be a major source of companionship and security — two of the qualities many people look for in a marriage. Marianne Kilkenny, founder of Asheville, NC's Women for Living in Community, says she enjoys having someone to leave the light on for her when she comes home at night, and describes a recent birthday when "I was feeling blue, and when I left my room, on my doormat were four birthday cards and two little gifts." Many people turn to partners for this kind of support, but romantic coupling shouldn't be the only option for people who want to avoid loneliness in their later years. Some people marry with an eye toward having someone to grow old with, but it doesn't always work out that way — and plenty of others would rather not have to marry in order to secure companionship in their later years. Luckily, more women seem to be exploring other options.